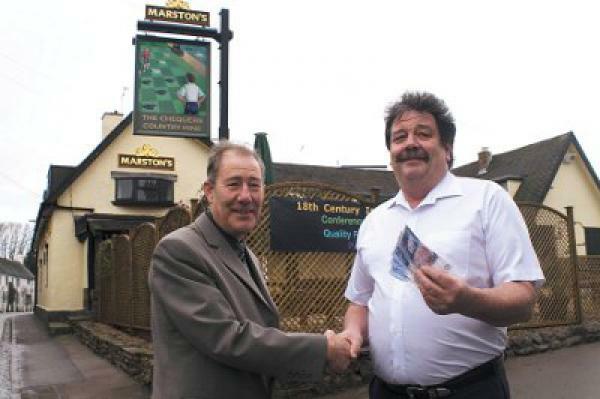 John Brewerton, owner of the Chequers country inn, Ullesthorpe, handing over a cheque to Martin Allen of lutterworth age concern. The money was raised in conjunction with radio leicester’s ‘sing christmas’ on 18th december 2008. As part of this family occasion, father christmas came along to draw the charity raffle and customers were offered a ‘special’ fish and chip dinner (for each meal purchased, the chequers donated £2.00 to charity) and the cockles were warmed on this very cold night by mulled wine kindly donated by marston’s brewery, the proceeds going to charity. As part of his ongoing commitment to provide affordable events and raising money for local charities, john runs a very successful bingo lunch which offers a freshly cooked lunch with bingo afterwards. This is attended by nursing homes, residential groups and young at hearts coming far and wide for an opportunity of a nice away day for all involved.